My husband and I celebrate two wedding anniversaries. One in December and one in August. We just recently celebrated our 4th December anniversary and that got me thinking about our wedding. The reason for two is because we technically had two wedding ceremonies. A civil one in New Jersey and a church one in Istanbul, Turkey. Both involved a party, a DJ and wedding cake, but we bit the bullet a little bit and tried to stay away from anything too extravagant. Because we knew we would have two celebrations, we tried to do as much of it as DIY as possible and in the end that saved us money, time and reduced the amount of waste we generated. I thought I would recap some of what we did because looking back on it, it was a little bit minimalist and a little bit zero waste even if we didn't know it back then. These tips have also been shared on Life and Money by Citi. I'm not one for parties for myself so I did not have bridesmaids, although my sisters and close girlfriends were there to support. Without a formal wedding party, I also did not have a bachelorette party which was ok with me. This reduced another expense plus a lot of wasted single-use items from being used. I knew that a good amount of my close circle of friends would end up traveling to Istanbul for our second wedding ceremony so we made up for it by adventuring in Istanbul. We opted out of having real flowers because of the expense and the waste. With quotes ranging in the thousands, we didn't want to spend that kind of money for a one night thing. Instead, I went into the wonderful world of Etsy and found a shop that made paper wedding bouquets and boutonnieres. I was able to customize them and they remain sitting on my desk still looking as beautiful as the day I walked down the aisle. No pesticides, no shipping of out of season flowers and no waste. Plus, you are supporting a small business making handmade items. My wedding bouquet 4 years later. Still looks good right? I don't know if this is just me, but when I attend weddings, I cringe when they hand out the favors. Partly because most of the favors I would never use no matter how meaningful they are to the bride and groom. I am also not one of those people that keep them and display them in a curio in my dining or living room. Most favors also come in plastic. They are also pretty expensive and my guess is most of the guests usually throw them out anyways. So for us, we opted out of favors. I did make unique seating cards for our guests which turned out to be a favor of their own. These were DIY Polaroid magnets that had a favorite love quote or song quote on them. These made for cute seating cards and people could take them home to hang on the fridge. I think they are pretty timeless since they had the person's name as opposed to ours and did not have a date on them. Because we didn't have real flower centerpieces, our centerpieces were made out of of old San Pellegrino bottles and large branches spray painted in silver. Our wedding was in December so there were plenty of twigs and branches for me to collect by our street. For the vases, it turns out Amazon sells these wonderful vases at half the cost you would pay to rent them. 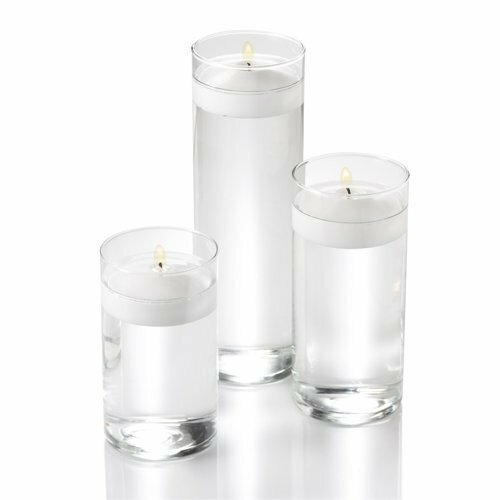 They come in 3 sizes and come bundled with floating candles. Additionally, I bought silk flowers to place inside. After the wedding, we put them on Craigslist. So we were able to get our money back and reuse and recycle decorations. I also was just at a thrift store recently and found these same vases for $.69 each. Use them for a day and resell them and you can probably net a bit more money than what you paid for them originally so a win win since you've also just saved plastic from being thrown away. I will also add that if you think about the last wedding you went to, do you remember the centerpiece? Now think about how much time you have or will spend deciding on the perfect centerpiece or the money that will be spent, is it worth it? Remember, there is a cost to everything, whether it's your money, your time, your sanity or your attention. It goes the same for those attending your wedding. Do you want them talking about the centerpiece or much fun they had and how they danced the night a way with the bride and groom? Decide what matters. Centerpieces made out of spray painted San Pellegrino bottles and branches. Centerpieces with purchased vases from Amazon, then resold on Craigslist. My husband and I found this restaurant with a view of downtown Manhattan. We used the space for the ceremony, cocktail and party/dining room. It was ideal because it reduced traveling for everyone. It was an easy transition. The restaurant staff did a great job changing the room from ceremony to party/dining room. It also meant that people had time to mingle with each other. There was no driving or parking hassle which I'm sure saved lots of time and aggravation. We were also able to catch-up with guests during the cocktail hour which was nice. Oh and a tip and this is only if you are into travel hacking and manage your credit cards well. Save your money and put your entire wedding bill on a credit card that will return you massive points. For example, we had ours at a restaurant which if using the right credit card will count it as dining earning more points. Those points can then be used for a future trip. Then pay off your wedding with the cash on hand. Win win and no credit card debt for the wedding. The same room before for the ceremony. The same room after for the dinner and party. Bought Francois Payard macaroons on a borrowed plate. Pretty right? A family friend made our wedding cake with cupcakes and we supplemented them with macaroons from Francois Payard. We borrowed a 3 tiered serving plate from my mom to display the macaroons. To ensure that everything was eaten and no dessert was wasted, we encouraged our guests to take some home at the end of the night. Instead of wasting food, we were able to distribute them and get people to eat them instead. We also kept the options simple so that there weren't too many choices. At the end of the night, I was hoping to eat at least one macaroon, but they were all gone. I guess they really liked them. The wedding industry is a very lucrative industry and you'll find a lot of articles on what you SHOULD have at your wedding, but this is your day. Make it unique. You don't have to follow each cookie-cutter tradition that has been laid out and done before. There are so many ways to make a wedding simpler, more minimalist without all of the frills and expense. It's ok to buck against the trend and do something that you love because in the end, it will shine through and make it more memorable. Remember just because the wedding checklist exists, it doesn't mean you need to do all of those things. The frills add time, cost money and distract away from the true purpose of the celebration which is for family and friends to witness and share in your love. Four years later, I wouldn't change anything about how we planned and our celebrated our wedding.